Being far from proficient at CAD, let alone 3D scanning and printing, I was surprised they even let me use the Geomagic equipment. See, I'm an intern. I was even more surprised when I produced something that not only resembled the original trinket I had scanned, but almost looked like something I would spend real money on. Maybe I'm a professional and I don't even know it. 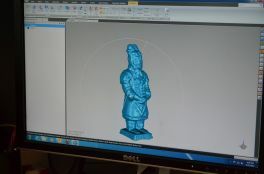 The object to be scanned was a 3-inch model of a terracotta soldier from China, complete with armor and an impressive mustache. 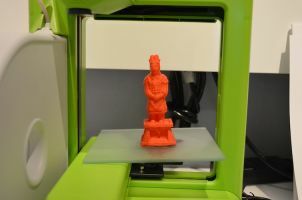 The scanning itself was not terribly difficult, requiring only a relatively steady hand and the ability to simultaneously pay attention to the computer screen, the object to be scanned, and the arm of the laser. With the help of Richard the engineer, I took two separate scans - one from the top and one from the bottom - to be sure that I had covered the full surface. These two scans then had to be stitched together and cleaned up using Geomagic Studio. Let me say again, I'm not an expert at this. But I could do it. And while I had a bit more trouble with the stitching, it was mostly due to the fact that I didn't realize there was a button, Mesh Wizard, which magically and automatically fixed all the problems I had spent half an hour trying to change manually. After I had a workable 3D image of the soldier, I set about creating a base for him in Geomagic Design Direct. The software was not difficult to figure out and soon, within a few hours, I had a small, square base of my own design. 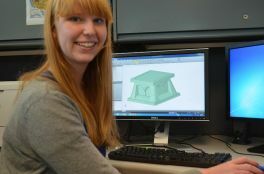 Did I mention that I have very little experience with CAD? I loaded both my designed base and the scanned sculpture model back into Geomagic Studio to merge them into one object. Next came about an hour of 3D printing on one of our Cube printers and now I have bright orange, three-dimensional reality sitting on my desk. Scanning + Geomagic Studio + Geomagic Design Direct + 3D printing. All in a couple of days. Pretty cool.